A distinguished team, headed by Dr Martin Buchheit and complemented by national institute sports performance specialists from New Zealand and Australia, have created a review paper that takes a critical look at the way in which heart rate variability (HRV) has been used in elite sports. 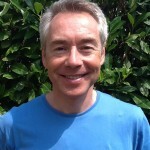 Dr Buchheit has over 90 publications in the area of HRV, sports performance, health & recovery, and currently works for the renowned ASPIRE sports facility in Qatar. The review highlights the potential issues and pitfalls of using HRV for performance & training monitoring and makes practical recommendations for how to apply HRV monitoring for best results. The team reviewed a number of studies (67, including some of their own), where HRV had been investigated in response to athlete adaptation and changes in training load, looking especially at the HRV collection & analysis methods. The researchers looked at vagal (parasympathetic) measures of HRV taken upon waking in the morning as these provide the best practical utility for individuals and coaches wanting to adjust training or make player selections for that day. They used this review to derive recommendations on how HRV should best be monitored and assessed, with example data from elite endurance athletes. I’m presenting this part as a list in order to make it more useful & easier to digest. If you are interested in the fine detail & justification I’d recommend reading the full paper – it’s a good piece and you can find a link below. In moderately trained (i.e. non elite) athletes, moderate training loads increase HRV in parallel with aerobic fitness. When training loads approach 100% of an individual’s maximum training capacity, HRV starts to reduce. HRV rebounds after periods of deliberately reduced training (e.g. tapering). In elite athletes, HRV can remain lowered in the lead up to competition despite achievement of best performances, possibly due to the maintenance of high intensity work during the taper. Studies that measured HRV in athletes who were already overtrained found both decreased and increased HRV. Although this has caused confusion amongst researchers, it is likely this is because the athletes’ previous HRV progress during the preceding period is not known, and may have contained a period of initially lowered (sympathetic dominant) HRV followed by adrenal fatigue leading to high (parasympathetic dominant) HRV. HRV shows quite high natural day to day variation, but weekly and rolling 7 day averages help smooth out the variations. 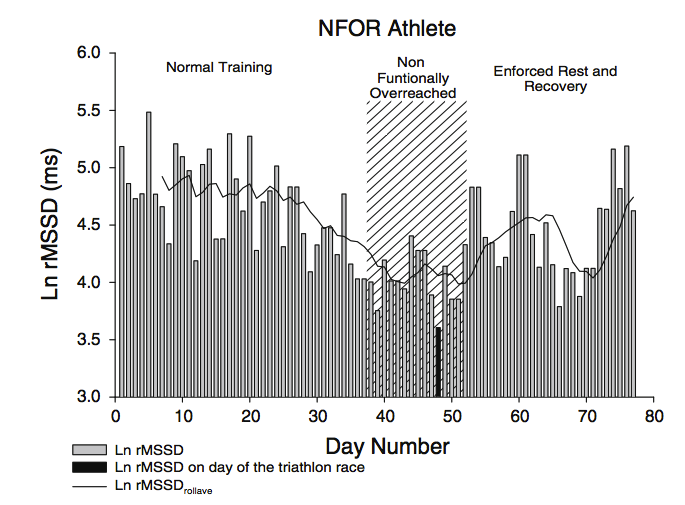 This makes trends more apparent and detection of non-functional overreaching (NFOR) easier, as the chart below from an overtrained athlete in one of the authors (Daniel Plews) previous studies shows. The concept of the Smallest Worthwhile Change (SWC, typically 0.5 x standard deviation) is useful in identifying when the HRV of an individual athlete has changed by more than would be expected by measurement variation alone, and is particularly useful in context of the weekly moving average (baseline). Time domain indices of parasympathetic HRV (especially RMSSD) have lower variation of measurement than frequency domain measures such as high frequency (HF). For instance, LnRMSSD was shown to have a coefficient of variation (CV) of only 12% compared to 52% variation using normalised HF power. Low resting heart rates (below about 55 bpm) in athletes cause the relation between HRV and resting HR to be disrupted by an effect known as parasympathetic saturation. Criteria for tapering at the elite levels means reduced parasympathetic and / or increased sympathetic activity in the run up to competition may reflect increased freshness and readiness to performance. HRV responses are individual and dependent on fitness level and training history therefore regular time based (longitudinal) monitoring is required to get the most out of HRV. Although this review was directed at elites, the HRV response in any athlete with a long training history will likely be the same. LnRMSSD is the most practically applicable HRV index, and is recommended for standardising future HRV studies on athletes. Both daily and weekly / rolling averaged HRV and HR are practically useful measures, and significant changes can be identified using the smallest worthwhile change (SWC). Parasympathetic saturation means it is important to consider both HRV and resting HR for each athlete over a period of time. Optimal HRV response to training overload & pre-competition tapers is not yet fully understood, but increasing HRV values as competition approaches may be a sign of positive adaptation or coping with training load, whereas reductions in HRV in the week/days before pinnacle events may represent increasing freshness and readiness to perform. LnRMSSD as the main HRV parameter measured in the morning, because it has the lowest variation, and is especially suitable for ultra short measurements of 1 min. (see also RMSSD). Creating a 7 day rolling average (the ithlete baseline) allows easier identification of trends over the previous week and month (the Weekly and Monthly change numbers on the ithlete chart view). At the sub-elite level, longer term trends (ie 1 month or more) should reflect changes in aerobic fitness. Ithlete dentifies significant changes in HRV using the standard deviation of LnRMSSD as the smallest worthwhile change (SWC), both relative to the baseline and from one day to the next. Using statistical methods to identify what is normal / abnormal for an individual over a period of time, rather than making any assumptions about the HRV or HR values of the individual athlete. Identifying both significant decreases and increases in HRV as potentially signifying maladaptation (non-functional overreaching). In the past it has been stated incorrectly that ithlete does not detect potentially harmful increases in HRV, but in fact ithlete has 3 algorithms for doing this. Trying to avoid parasympathetic saturation effects by recommending that athletes with low resting HR perform their measurements in the standing position. Our strategy is to continually improve ithlete and to keep fully up to date with the latest & best research in the field, but it is good to know that we have been on the right track this far. Great news! I’ve been very happy with the dashboard thus far and my usage with my athletes. The parasympathetic saturation is an interesting issues especially with MMA fighters whose resting HR’s tends to be in the low 40 to mid to high 30’s. I don’t work with endurance athletes, but I would image them having the same issues. Interesting and useful research. I am working with a 50m sprint swimmer and have been using ithlete since November 2011. We have recently begun using the team app which makes it a lot easier for me to monitor and to begin to look more at trends. With sprint training at elite level we don’t find progressive increase in HRV in the way that endurance athletes do. Training is a background of basic endurance, drills and technique with intensive work on speed, strength and power. The short trends show a dropping HRV as the week’s intensity accrues with small HRV recovery associated with recovery sessions. On the longer trends we seem to get a couple of weeks of increasing HRV following two week taper periods. So the general HRV rise seems to lag the taper by a week or so. We are still learning how best to wrap training around the recovery cycles but importantly we have seen a continuous improvement in performance over the period.